Two Bears Farm and the Three Cubs: There's a Monster on my Plate! There's a Monster on my Plate! Don't you just love the Mercer Mayer books? They are fun and often hit home with childhood fears. We like them all, but one of our favorites is There's Something In My Attic. 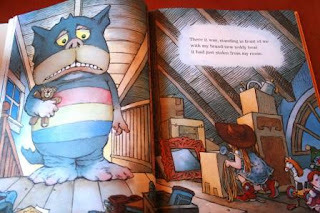 In this story, there is a monster in the attic, and he comes to steal the little girl's teddy. She decides to fight back by attempting to lasso the monster and take him to her parents' bedroom. So Pierce enjoyed a monster turkey burger with his fries and broccoli. He ate the eyes first. He just loves olives and pickles. Then we got some sheets of magnet out to make some magnet monsters for our fridge. We made different expressions for the monster. Pierce really likes switching out the faces. What a cute book! 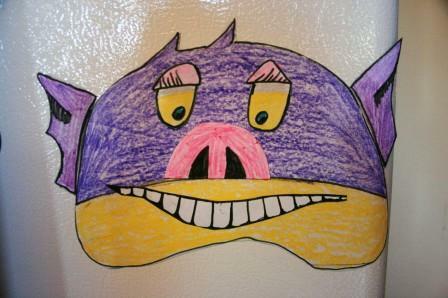 Love the monster sandwich and the faces on the fridge! Too fun! I just chuckled when I saw the magnet monster.. Oh that is so good. I'm trying to find things for Ben to do that is more fullfilling than playing nintendo.. He loves toy story. That sandwich you made for Pierce is ADORABLE! I love the sandwich. He is so much fun. The magnet is a great idea. I will have to try this with JDaniel. 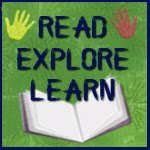 Thanks for being a reader, explorer and learner. 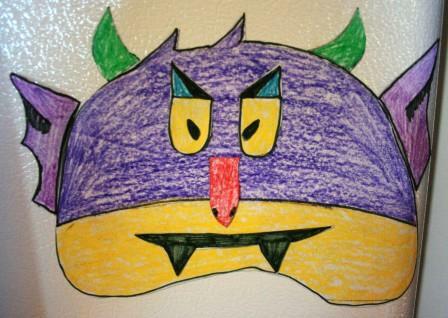 love this idea...Adrian would love the monster magnets...and your bentos this week were so cute. I ordered that Bear bento box too...it was one of the more boyish things I've seen lately. I had to come check it out again.